Since we last reviewed Skinny Pines, Jeff Borofsky has been tweaking his dough and wooing the folks who frequent the Westport Farmers Market with his weekly appearances. I went back recently and was so taken with the Bianca and his latest crust, I had to share the experience on Slice. Skinny Pines dough is made from hard red winter wheat, a 100% whole wheat grain milled to 00, sourced from Wild Hive Farm and Bakery in Clinton Corners, New York. 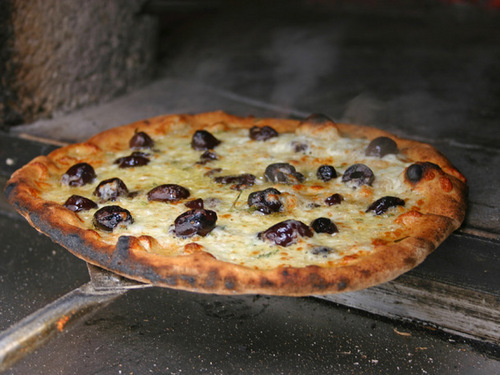 The dough itself is treated to a 12-hour cold fermentation before it's left to rise for its weekly market appearance. This whole wheat dough is used on each and every Skinny Pines pie. The combination of finely ground 00 whole wheat flour and the wood-fired oven creates a light and airy crust, with just a hint of pleasant nuttiness. Read the full Slice review.